The Movie Bloggers Roundtable is a new feature where I join up with four esteemed movie bloggers and we share our thoughts on a certain subject. Everyone on the panel will share their thoughts and feelings on the topic of the day and then we share them with you. The panel may change from post to post and hopefully we will get a wide range of opinions and perspectives. Who WILL win this year’s Oscar for Best Picture and who SHOULD win it? For me this is an easy one to answer. Alfonso Cuaron’s “Gravity” was one of the most captivating and thrilling motion picture experiences I’ve had in a while. The visual artistry on display is unquestionable. Cuaron and his amazing team have created one of the most stunning and stimulating canvases you’ll ever see. But there’s also a stirring story of perseverance and personal rebirth that I found so satisfying. I’ve seen “Gravity” four times and each time I’ve left with a full heart and a full appreciation for Cuaron’s amazing accomplishment. It deserves to win Best Picture. While we may have a good race going for the Best Picture Oscar, there’s one film in the running that seems perfectly in line with what the Academy loves. It’s a historical piece, it deals with an emotionally charged subject, and its been a hot topic since its debut. I’m talking about “12 Years a Slave” and I believe it will win the big prize. Thankfully “12 Years” is a really good film. It’s not getting Oscar hype just because of the subject matter. It’s very well-made and it features some breathtaking performances. It’s not perfect, but it’s right up Oscar’s alley and I think it will hold off its competition. Gravity. On top of being a technical marvel, it’s a film unlike any other in that it gives you a full immersive experience as you watch it. It’s got drama, suspense, humor, and despite being set entirely in space, an organic quality that’s stirring and emotionally gratifying. It’s a film that will be talked about for years to come, both by film students and casual moviegoers. 12 Years A Slave. No doubt it’s one of those important films of the decade and made by a filmmaker who’s been a critical darling despite this being only his third feature. Its genre and subject matter of slavery is quite popular in the Academy, and it’s been gaining traction in other award circles. In what is one of the most hotly contested Oscar races in quite some time, it’s a tough call to predict which film will walk away with the coveted Best Picture award. Frankly, I find it shocking that the Coen brothers’ “Inside Llewyn Davis” never even received a nomination but again, it shows the strength of the competition this year. Personally, I think Spike Jonze’s “Her” should win as it would confirm the academy’s appreciation and support for original filmmaking. I don’t think there’s a more original movie amongst the nominees this year and “Her” certainly stands out on its own terms. That’s being said, it won’t win. In choosing the winner I think the academy will be deciding on the importance of the film itself and for that reason it’ll come down to two films; One will be “Gravity” for its astounding achievements and advancements on the use of 3-D but I think that will most likely be recognised in the technical departments, leaving the likes of “12 Years A Slave” to walk away victorious with the big award. The academy seem to love a solid historical drama and Steve McQueen’s film has that edge of quality and importance that will sway the voters’ decision. Gravity. Cuaron’s film is beautiful in every way – a technical marvel with an elegant story that makes the movie so timeless and relatable. It is a wonder and the one that has a heart. 12 Years a Slave. The Academy loves movies about history, filled with emotional moments. And everyone during this Oscar season seem a bit too afraid to reward something other than ‘the most realistic movie about slavery ever made’. It’s a pretty strong year this year and I don’t think you could begrudge any of the films a win to be honest. Each brings plenty to the table and are all well worth your time. I went back and forth between a few of them as to which I thought should win and I finally decided on Gravity. I still think it has its problems – The script is dodgy and George Clooney thinks he’s still in a coffee advert, but it’s a film that makes you realise why you love the cinema. It’s one of the most immersive cinematic experiences I’ve ever had and actually makes good use of 3D. Any film that does that deserves to win in my eyes! Although there has been talk of American Hustle and Dallas Buyers Club being dark horses for the award, I see it as a straight fight between 12 Years a Slave and Gravity. These were the two cinematic juggernauts towards the back end of 2013/start of 2014 and I’d be very surprised if one of the others won. It’s difficult to separate them but I think 12 Years a Slave is just going to nick it. It just fits the bill. The setting, the subject matter, the strong performances, the great directing; it’s the kind of thing the Academy normally laps up, and it wouldn’t surprise me in the slightest to see Steve McQueen picking up the well deserved Oscar. I want to thank Ruth, Mark, Sati, and Chris for participating in this inaugural Movie Bloggers Roundtable. You have heard our thoughts, now we want to hear yours. Do you like the feature? 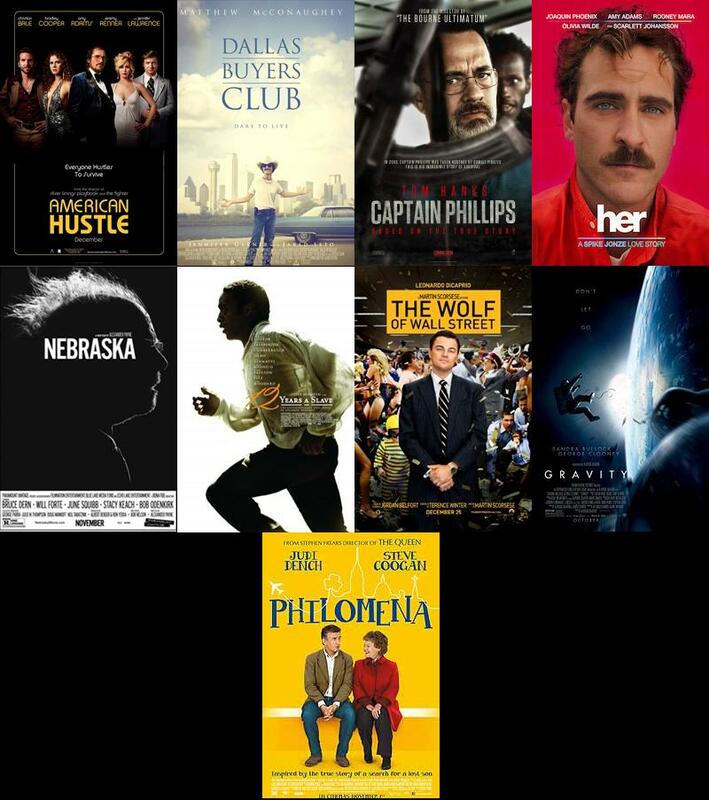 More importantly, who do you think SHOULD win Best Picture and who WILL win Best Picture. Please share you thoughts in the comments section below. This entry was posted in Movie News and Articles and tagged 12 Years a Slave, American Hustle, Captain Phillips, Dallas Buyers Club, Gravity, Her, Nebraska, Philomena, Wolf of Wall Street. Bookmark the permalink. Very interesting to read these here at this roundtable. I love the discussion too. But I disagree. I think that the Academy will end up shying away from 12 Years A Slave when it comes to best picture and that Gravity not only should win Best Picture but will win it. Of course, who knows…the Academy may just be completely off the wall and give it to Her. haha. Love that you’re with me on “Gravity”. It definitely deserves to win in my book. I just honestly think it will fall short. I think Cuaron will win Best Director therefore giving the film some love. But I think the big prize will go elsewhere. Who knows, we both may be wrong and American Hustle walks away with it. I really hope not but who knows? absolutely man. I love this segment and raise my hand to hopefully have a seat at the table in the future at some point. Oh you will definitely have a seat. You can count on that. Hopefully this will go over well with folks. If so I can’t wait to do more! We definitely agree on 12 Years winning. I still prefer “Gravity”. Which is your personal favorite out of the nominees? I know they aren’t your favorites but I like Wolf and Her. 🙂 They are underdogs to win best pic. Definitely underdogs. I liked Her but I did think there were a few kinks. I really disliked Wolf though. It has a huge following. It’ll be interesting to see if it will make any waves tomorrow night. Good commentary, all. I think, hands down, that 12 Years should win. As you read, we definitely agree that it will. I’m still rooting for “Gravity”. But oddly I’m not 100% confident. I think there is a couple of upsets on the way and it could be in this category. I love the idea of this post. Looking forward to future episodes. I think everyone has called this one correctly. Gravity is the Film of the Year and 12 Years a Slave will be the Academy pick. The only one I have not seen yet is Her and that will be corrected tomorrow. Sorry Mark, I think you and everyone else has it right, even if it is as great as you say, there is no chance it will walk away with the prize. I’ll be looking at everyone’s post Oscar analysis next week. Have a great Holiday on Sunday everyone. You too my friend and thanks for reading. I always enjoy appreciate your comments. Glad to hear you share the love for “Gravity”. I really wish it would win but I don’t see it happening. But are you getting the feeling that this category is still up in the air? Yeah, I loved Her, Richard but it’s a bit of a dream for it to win best picture. It’ll never happen. I honestly wouldn’t mind 12 Years or Gravity taking it. For different reasons they’re both worthy! Love that someone picked Her! Was my favorite and also the best (I thought) out of this year. No way it’ll get best picture, so I’m rooting for it to get screenplay, which is hopefully more realistic. I too am going with 12 Years a Slave here. I called it back in September and I’m not switching now, ha ha! It’s right up the Academy’s alley, and it’s a really good film. If Gravity wins I’ll be a bit surprised, but if anything besides those two win I’ll be completely astonished! Either way we’ll find out Sunday night. Nice discussion! Thank you and I appreciate your comments. I think everyone at this Roundtable loved “Her” except me. I did like the movie but apparently not as much as most. I’m with you, “12 Years” looks like the winner with “Gravity” being its biggest competition. But there are rumblings of another potential winner namely “American Hustle”. Did you happen to see it? More of a performance based picture and not one that I personally think deserves the Oscar. I did see American Hustle, and I didn’t like it very much. My hopes were entirely too high and for some reason it just didn’t live up to them for me. If I was to give the film any awards it would be for Bale or Adams, but not over the others nominated in their categories. I could see the academy potentially going for it, based on how little in actual awards they gave Silver Linings Playbook last year, but in the end I really doubt it. Both Gravity and 12 Years have more going for them I think. I didn’t think American Hustle had much substance past the performances. But the Academy adores David O. It’s certainly not a movie we will be talking about 10 years from now. I think it has an outside chance but I’m hoping not. This is great. Hoping that this will be a recurring segment for your site. Would be great to see these illustrious maestros sounding off on other topics. Thanks. If the response is good it’ll definitely be a reoccurring thing. It was a lot of fun to put together and of course the participants were fantastic. This was great to read! I’d be happy with either a Gravity or 12 Years win for Best Picture but I do think 12 Years will win and Cuaron will win Best Director to balance the major awards between the two. That’s pretty much how I see it too Caitlin. Cauron will be awarded for director as I don’t think Gravity quite had the depth in terms of story. Exactly, exactly. I too think that is how it will play out. But the interesting thing is there is more uncertainty in some categories than in past years. That makes this year’s Oscars a bit more intriguing. I don’t think that will effect Best Picture but there are some rumblings! If American Hustle was to win, I’d want to resign my membership to the human race. I just don’t want to live in a world where that could happen. And Chris, I’m pretty sure ‘coffee salesman’ is Clooney’s only setting, bles ‘im. I certainly don’t think “Hustle” deserves it. But the cast and crew has been hitting all the pre-Oscar parties and talking to all the right people. Still, it would be a monumental shame if it won best picture this year. I feel the same about American Hustle. But my dislike for the film makes me feel like it has a good chance at winning — the Academy’s choices rarely ever align with my own, and in many cases it feels like the winners have been selected solely for the purpose of making me angry haha. LOLOL! I know that feeling! I’ve felt the same way before. Lets hope that this won’t be one of those occasions! Fingers are crossed! I really did love that movie and it would be fantastic for the academy to award it but I reckon we’ve all got it right here. 12 Years a Slave is one of those films that the academy won’t overlook. But saying that, look what happened to The Color Purple! 11 noms and not a thing to take away. Also, remember the year that Shakespeare In Love walked away victorious and the likes of Saving Private Ryan and The Thin Red Line were overlooked? These surprises happen on occasion. I’ve just been reading up on historical ‘best pictures’ and was surprised to see so many mediocre nominees, not to mention lots of surprising winners! Just goes to show Oscar doesn’t always get it right, and the winners aren’t always the memorable ones that stand the test of time. It really is hard to predict. That’s very true. I have an Oscar related Phenomenal 5 coming out for tomorrow that touches on this very subject (to a degree). Hope you’ll check it out. Oscar definitely has a unique history. Ooh, sounds good. I’ll definitely have a look. You’re exactly right. I think there’s a chance that neither “Gravity” or “12 Years” wins. It’s a weird year. As for “Her”, I’m glad you picked it. It added a little diversity into the mix! Thanks so much for participating! I think I’m with Mark. Her should win… but I wouldn’t be upset if 12 Years a Slave did, or Gravity really. Cheers Abbi. I was feeling a little alone for choosing Her but I reckon the consensus is spot on. It’s hard to see past 12 Years a Slave. For me it’s the uniqueness of Her. It was always going to be really challenging to pull off the concept convincingly and the fact that it happened is remarkable. 12 Years a Slave is outstanding though. Thanks for the comments Abbi. Her definitely has a big following. You and Mark certainly aren’t alone there. This is fantastic mate, really cool feature and proud to be a part of it! I think it’s funny how we’re all pretty unanimous in our picks (apart Mark!). This is where Philomena goes and wins it and surprises everyone! Really appreciate you taking time to join in. Love what you brought to it. I think we should do this again! I thought Philomena was brilliant! Not Best Picture quality though. Definitely up for doing it again mate! I liked Philomena especially in the first half. But I thought it went off the rails a bit in the second half especially with some of its silly (and downright weird) political beats. Still Coogan and Dench were superb. Please don’t even jest about Philomena taking it. Can you image? Not that it’s a bad film, I actually quite liked it but I don’t even think it should have been nominated. The Magdelene Sisters is a far better film than that yet recieved no love when it was released. I especially question Philomena’s nomination when a movies like “Llewyn Davis” and “The Hunt” didn’t get one! That echoes my thoughts exactly! As much as this is a hotly contested year, the ones that have been omitted are quite glaring! Great job, man. Fantastic read! Thanks man. So tell me, who is going to win? It’ll most likely be 12 Years a Slave. That’s the easy bet at least. Oh wow, so funny how most of us said the same thing! It would be awesome if Gravity won. Wouldn’t it be great? Sadly I don’t think it will happen but you’ll hear a loud cheer from me if it does! Oh and thanks for your contribution. I really do appreciate you taking part in it. It was a lot of fun to put together mainly because of you all! A superb post. It was really interesting to her from a variety of people even though the consensus was the same. I agree there’s little doubt in my mind that either Gravity or 12 Years a Slave is going to win best picture. Thanks a lot. I was hoping it would be received well and it helps that some great bloggers contributed. My hope is to have different bloggers take a seat at the roundtable from post to post. Mixing and matching different points of view could be pretty entertaining. Look out though, I may be calling on you! I’d really enjoy that, aye. Awesome Keith, that is very interesting that pretty much everyone agree w/ who WILL and SHOULD win. Bravo Gravity!! That said, I agree with Mark that I wouldn’t cry foul one bit if HER won this category though the chance of that is slim. I personally would rather have Gravity and Her be neck & neck this award season than Gravity w/ 12 Years of Slave. Thanks for letting me take part in your first roundtable Keith! Thanks so much Ruth. I sure do appreciate your willingness to participate. I wrote mine before reading anyone else’s and couldn’t help but laugh at how similar our conclusions were. Tomorrow night should be fun. All the questions will be answered for sure then. Loved this feature, the roundtable rocks. Thanks man. It was a lot of fun. I hear ya. I think “Gravity” deserves it. It seems to be getting some backlash from those who seem to detract points because a movie is successful. For me “Gravity” was so much more than just a big special effects flick. I was riveted to the screen and blown away by the visuals. But I also loved the constant theme of personal rebirth. It really resonated with me. Absolutely! I think Ryan (well, Bullock) was absolutely marvellous, and the story was just as breathtaking as the visuals. I’m interested to see how it translates to the small screen, but even if it loses some of it’s charm, it’s still going to be one of the best films I’ve seen. I have seen it four times (once recently on my 55 inch TV). I too was concerned about whether or not it would retain it’s visual magic. Let me just say it really, really does! Obviously it isn’t as jaw-dropping as seeing it on a huge theater screen in 3-D, but it still looks incredible. LOL. South Arkansas. I’m a small town guy. Awesome idea doiing these Roundtables! Very hard to pick with so many awesome movies nominated. I probably would want either Gravity or Her to win. Have not seen 12 Years a Slave yet, but I can understand why that one would win. Thanks my friend! Be careful. You may be asked to join the next Roundtable! Nice discussion! 12 Years does seem to be the odds-on favorite, but I honestly wouldn’t be surprised if Gravity pulls off the upset. It’s refreshing to not have a guaranteed lock this year at least. Oh I agree 100%. Isn’t it nice to actually have some mystery to this year’s Oscars? Thanks for reading! Nice job with this roundtable. It looks like the group had a pretty good idea of what would happen, and I was on board with that pick as well. I’m looking forward to reading these in the future. If you ever need a participant, feel free to let me know! Hey thanks for reading. This was a pretty popular first feature so I definitely plan on doing it again. Don’t be surprised if I shoot you a message asking you to join in.